We encourage you to attend & gather seeds at the exchange even if you don't have any to share. If you do have some, here are some tips. Bring your favorite open pollinated seeds to share with other gardeners at our Feb. 2 Seed Exchange. It's best to take these steps prior to bringing your home grown seeds to the event to help other gardeners know what to expect from your seed. Make sure the seeds are still viable by either being no older than three years old, or conduct a seed germination test (easy!). Separate your seeds from the husks. If you can, label your seed container with the common name and the genus and species, if not, we can help. Add the date or at least the year of seed collection. Bring your own labeling pen (sharpie marker) and envelopes. Here's a pdf document you can print to record and organize this info. Get the kids involved! 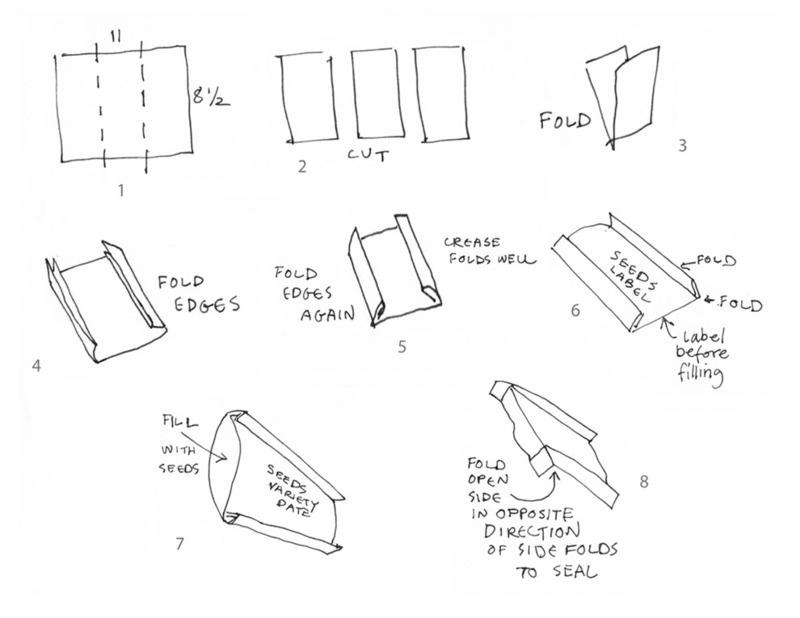 Follow these easy instructions on how to fold your own seed packets, or these easy instructions for a different packet design. The Seed Saving Resurgence: What's It About? Educate Ourselves! Snoqualmie Valley Seed Exchange is just one of many local seed sharing endeavors to gain in popularity around the world over the last few years. It is a natural progression from those who want local food grown in a sustainable way. What is more local than growing your own? Or, buying from a local farmer who is growing in a sustainable way? It's not sustainable, though, if you have to buy your seed when you have a low income. Others discover that after growing a variety for several years, it's no longer available for sale, anywhere! 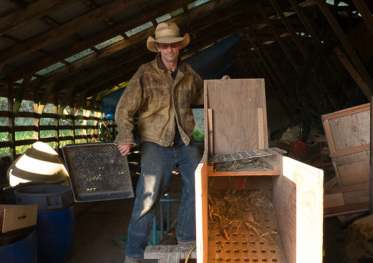 For local farmers, buying seed is a huge expense. You can attend SEED SAVING SCHOOL online with the Rocky Mountain Seed Alliance. Seed saving authority Bill McDorman has created the Seed School and now offers us a self-paced online version. 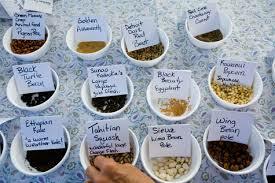 Learn about the larger movement to advocate for the legality of seed libraries and seed swaps. AcresUSA's January 2019 issue has a number of articles on seeds and seed saving. This article published January 2015 on shareable tells the story of a grass roots seed sharing advocate. Visit seedsave.org for basic seed saving information, or to enroll in seed school, or take an on-line seed saving course. Here's an article from Yes! magazine on the largest seed exchange in the world, in Greece, as a living Seed Bank. And a Dec. 2016 article on the Open Source Seed Initiative, which is working to put open pollinated varieties and their genome closer to public domain rather than patented and protected. Inspiring! This movement to legalize the open sharing of seed resources has come a long way in the last few years. Here's a Nov. 2018 article about the impact of farmer-saved seeds in Africa, found on Resilience.org. Learn more about organic seed saving and crop breeding efforts at the Open Source Seed Initiative and Organic Seed Alliance. Our regional seed farmers/suppliers are working on breeding vegetables (and flowers & herbs) so that they thrive in our climate with organic systems. Support them! 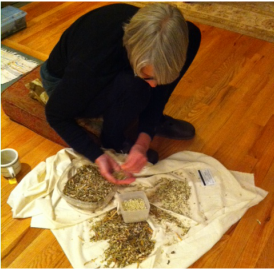 The more I learn about seed saving the more I recognize the importance of our professional organic seed growers. Some favorites: Uprising Organics, Adaptive Seeds, Wild Garden Seed, Resilient Seeds, Fertile Valley Seeds, Peace Seeds. These are all Oregon and Washington seed farmers/breeders working to bring us varieties that do well here. Watch the video below to learn about the effects of GMO seeds and seed patenting on farmers.